BETTER LATE THAN NEVER! I recently learned more about the Book Review Process, so please excuse my delay. I hope this will not be a factor as I will be releasing the Audiobook for this novel in Summer 2018. I am currently working on the sequel. Had trouble uploading the book image. The saying “six degrees of separation” has a completely new meaning in the city of Oakland. Although, considered one of the larger cities in Northern California, where even family members can be considered strangers; three families, attempting to distance themselves from their painful pasts, find themselves engaged in a game of deceit, buried secrets and murder. The Tucker Family is considered the ideal family. SAMSON and DEBRA live in an affluent neighborhood with access to the best schools and an abundance of love. EDMOND, an auto industry executive and CHARLENE, a nurse, have done everything in their power to provide their children with the best of everything as well as strive to keep their strained marriage intact. Ladies’ men and best friends, LANCE, ELIJAH and CHARLES have it made. Blessed with good looks, adoring, protective mothers and their pick of the city’s most beautiful women; the friends are living the life that most men have only dreamt. So why is it that they all just can’t seem to get Beyond the Hurt? 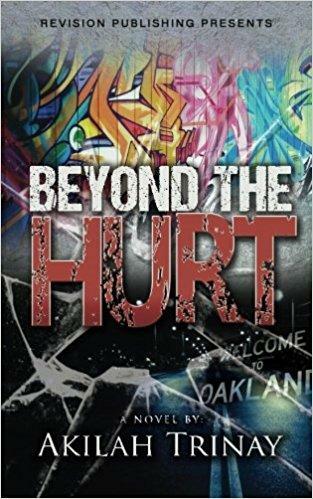 In Akilah Trinay’s Beyond the Hurt, the author not only addresses common issues that constantly plague the African American community, but also she provides an in depth look into the rationale behind the often criticized actions of men and women in relationships. Hi Akilah. Are you from Oakland? If so consider going to the Sacramento Black Book Fair. It is being held next weekend. I'll be giving a presentation on #readingblack. The issue of reviews our are books can be discussed. You are not too late for sharing information about your book. Ideally most publishers of reviewer prefer to review books prior to publications. I no longer pay a reviewer to write a review for books which has been out for more than 6 months (I need to add that condition to the criteria). A commissioned review, of course, is an an exception.